This shop has been compensated by Collective Bias, Inc. and its advertiser. All opinions are mine alone. 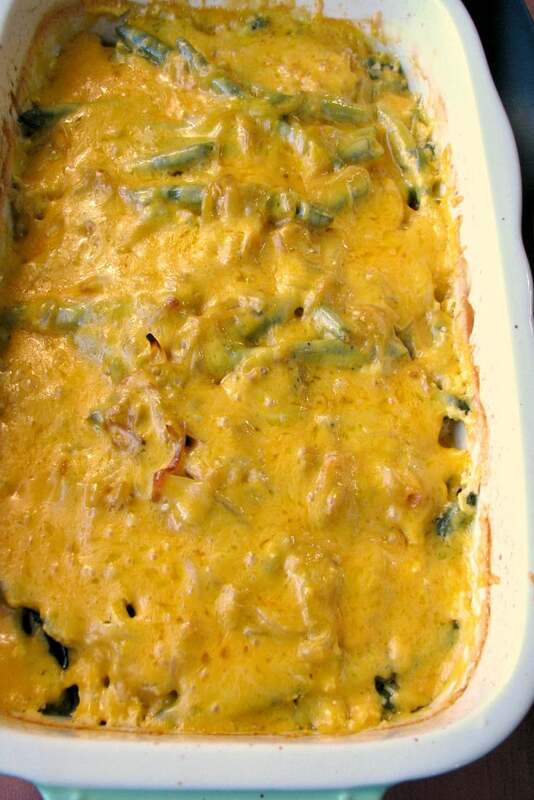 #PotPiePlease #CollectiveBias This Fresh Green Bean Casserole with Carmalized Onions is baked in a creamy cheese sauce, then topped with more cheese. It makes a great Thanksgiving side dish. 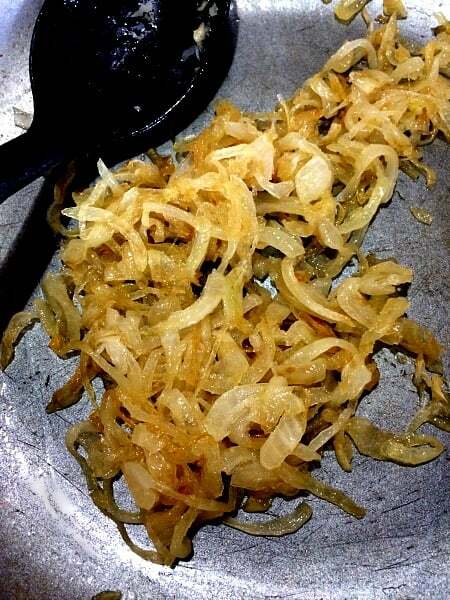 The caramelized onions can be prepared the day before and refrigerated until needed. This post has been updated from the original post sponsored by Marie Callender’s. Links to expired coupons and sites have been removed, as needed, and the text and photos updated. You know I love Marie Callender’s Pot Pie’s, I’ve told you about them before when I shared my Slow Cooker Cinnamon Apples last year. 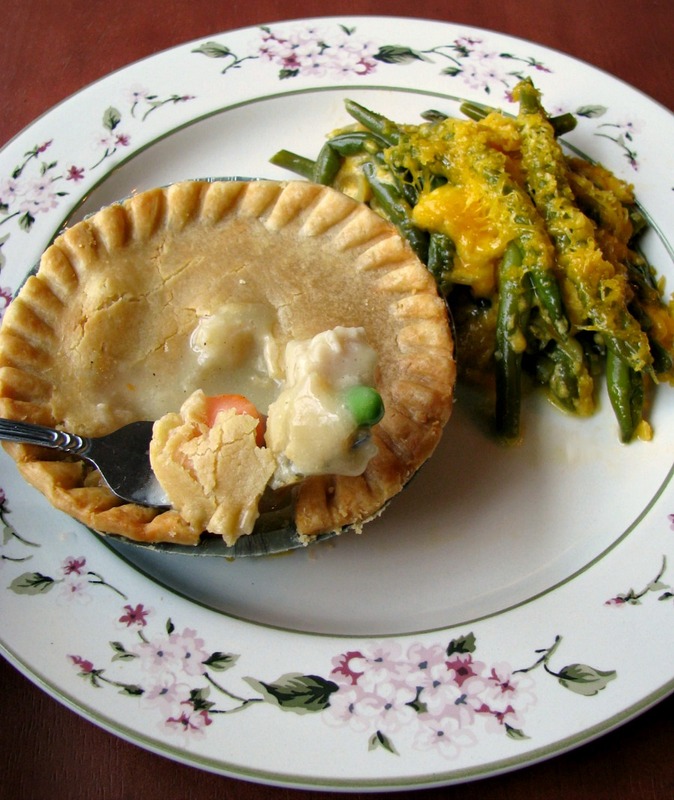 I think the turkey pot pies, or any kind really, would make a great alternative to a traditional Thanksgiving dinner for those working on Thanksgiving or for small families that don’t want to cook a full 4-5 course meal. They are a great wholesome dinner for any cold day, entertaining, or holiday meals. I thought a green bean casserole would pair well with the turkey pot pie I was planning on making, so I picked some fresh green beans up from the fresh produce isle. I’ve never liked traditional green bean casserole, and I knew I could make it so much better. 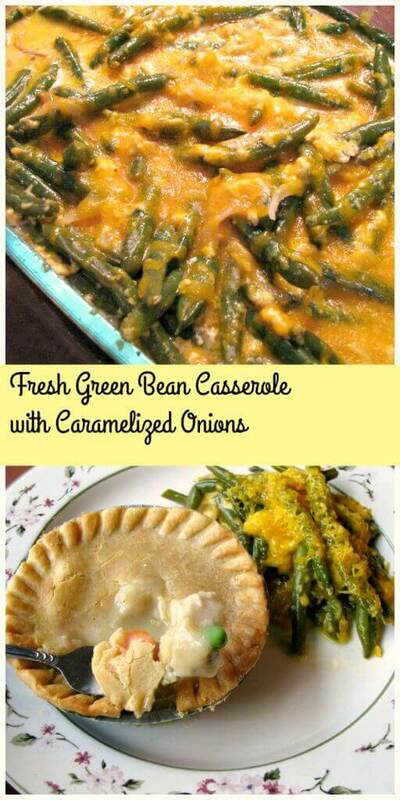 Green beans with caramelized onions sounded good to me, and a green bean casserole with cheese, yes! I timed this recipe out so that both the pot pies and the casserole are ready to eat at the same time. 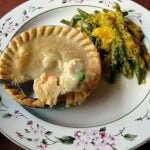 I used the individual 10 ounce pot pies with this recipe, the family size will take longer to bake. 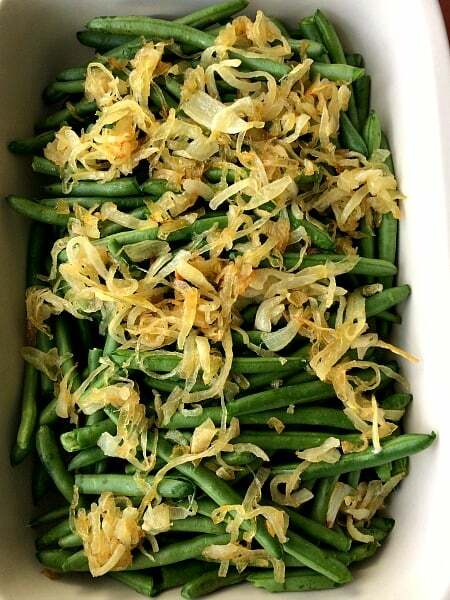 Here’s how to make a Fresh Green Bean Casserole with Caramelized Onions. Melt butter in a cast iron or other deep skillet over low heat. 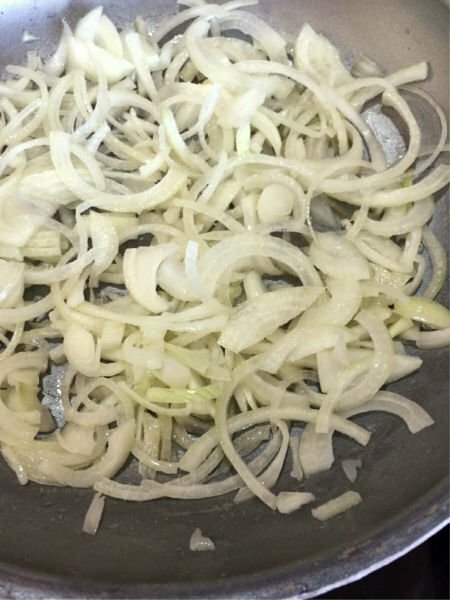 Add sliced onions, sprinkle with sugar, stir to coat with the butter. Cook over low heat, stirring every ten minutes until golden, adding water a teaspoon full at a time if needed to keep the onions from sticking to the skillet. Continue to cook over low heat, stirring every 5 minutes or so towards the end, until the onions are soft, dark golden brown, and sweet, about 40 minutes. 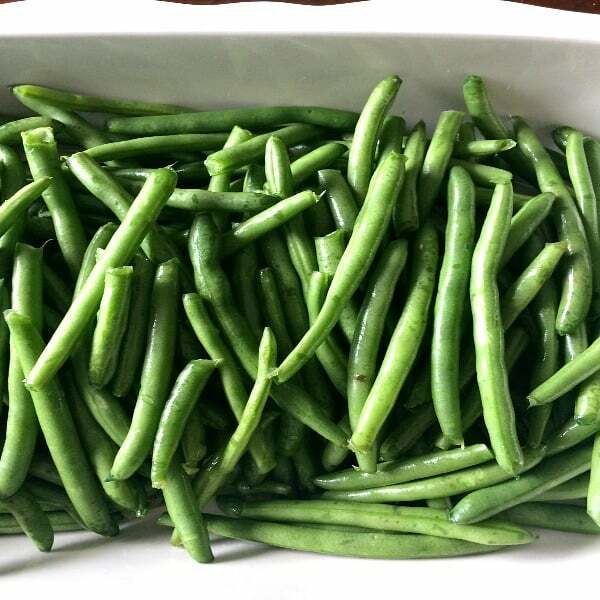 Preheat oven to 400 degrees F. Place trimmed and washed green beans in a large baking dish. 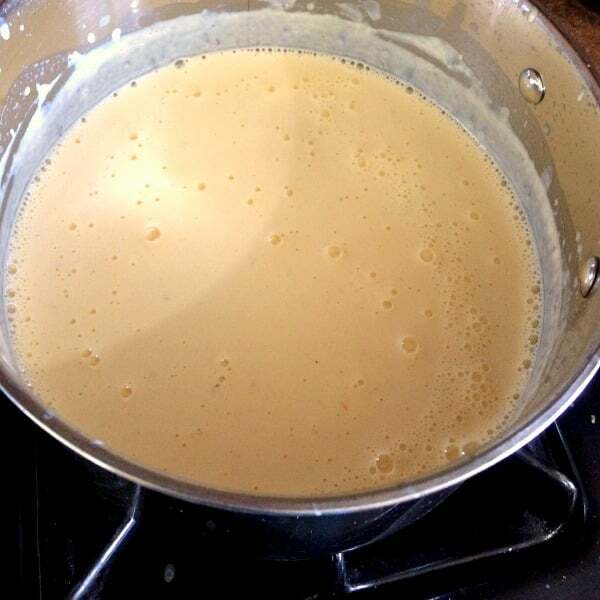 Heat the cream and milk over medium-low heat until it begins to steam. SLOWLY whisk in 8 ounces of the cheddar cheese, a small handful at a time and whisking constantly while allowing each addition to melt fully, until all the cheese is melted and creamy. You may have noticed in the photo of the finished Fresh Green Bean Casserole with Caramelized Onions that my cheese sauce curdled. The first time I made this recipe it did not, so I tried to figure out what I did wrong this time. I found my answers on Food 52 . I used 2% milk this time when I used whole milk last time, and I seasoned the casserole with salt before I baked it, which I don’t remember doing last time. I have now recommended whole milk and no salt in the printable recipe card. If your cheese sauce does curdle, it is still fine to eat, it just doesn’t look as nice. Pour the cream mixture over the green beans. Cover with foil and bake for 30 minutes in the middle of the oven. 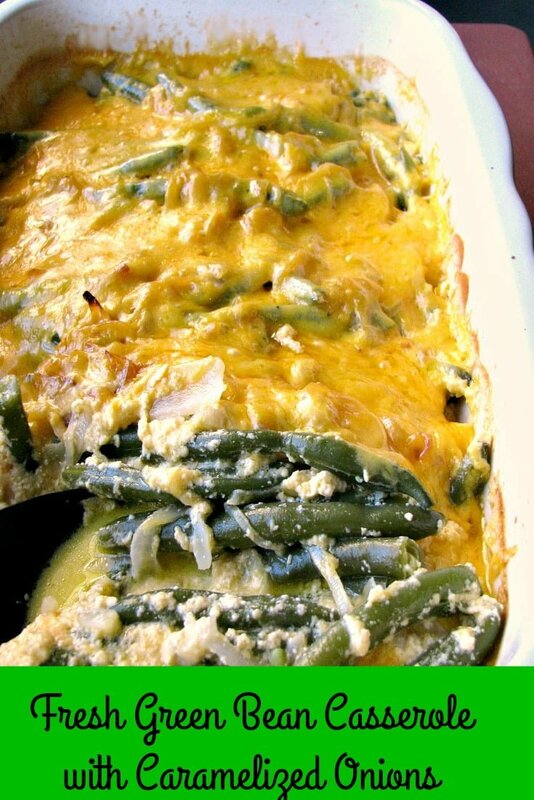 Uncover, check that the green beans are tender, top with shredded cheddar cheese, and bake for 5-10 minutes more until the cheese melts. Check out more side dish recipes at ConAgra Foods Foods You Love, or follow ConAgra foods on Pinterest and I’d love to hear what your favorite side dish is during the holiday season. 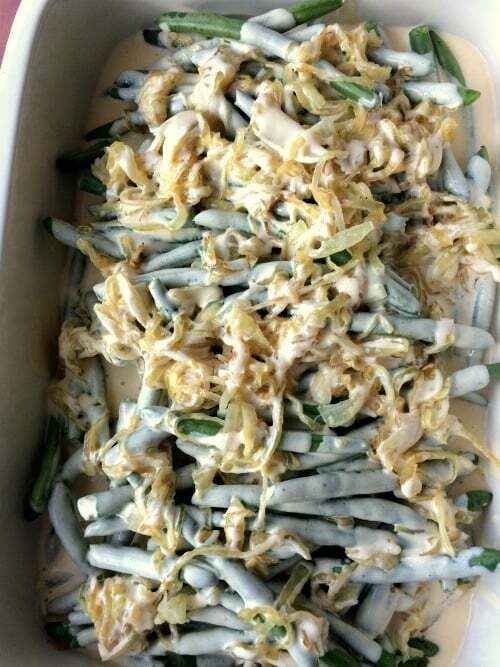 Non-traditional green bean casserole made with fresh green beans, caramelized onions and creamy cheddar cheese. Melt the butter in a cast iron or other deep skillet over low heat. Add the onions, sprinkle with the sugar, stir to coat with the butter. Cook over low heat, stirring every ten minutes until golden, adding water a teaspoon full at a time as needed to keep the onions from sticking to the skillet. Continue to cook over low heat, stirring every 5 minutes or so towards the end, until the onions are soft, dark golden brown, and sweet, about 40 minutes. 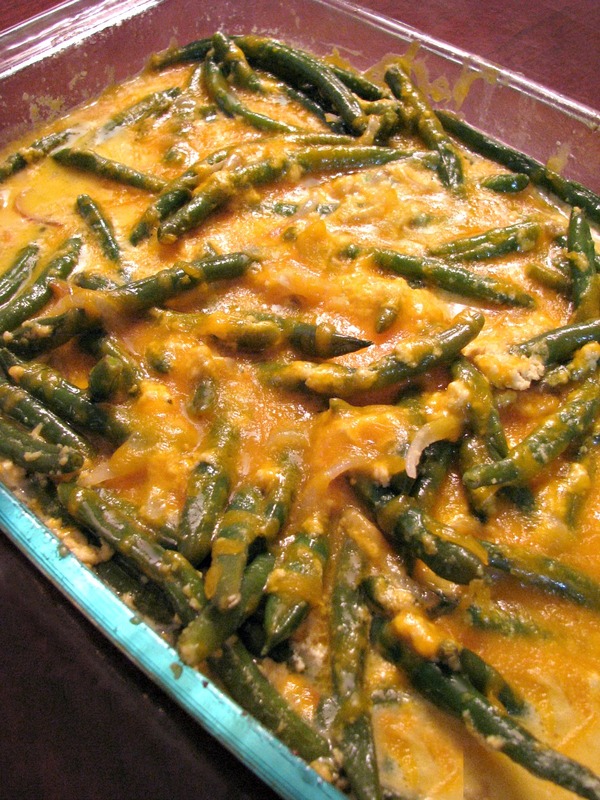 Preheat oven to 400 degrees F. Place the green beans in a large baking dish. Top with the caramelized onions. Heat the cream and milk over medium-low heat until it begins to steam. SLOWLY whisk in 8 ounces of the cheddar cheese, a small handful at a time and whisking constantly while allowing each addition to melt fully, until all the cheese is melted and creamy. Pour the cream mixture over the green beans. Cover with foil and bake for 30 minutes in the middle of the oven. Remove the casserole from the oven, uncover and sprinkle with remaining cheddar cheese, place bake in the oven, uncovered, for 10 minutes more or until the cheese the melted. Let stand for 5 minutes before serving. Notes: Prep time includes time to caramelize the onions. These can be made ahead of time, cutting prep time to ten minutes. Pot Pies: I served the 10 ounce pot pies, which are ready in 45-48 minutes. 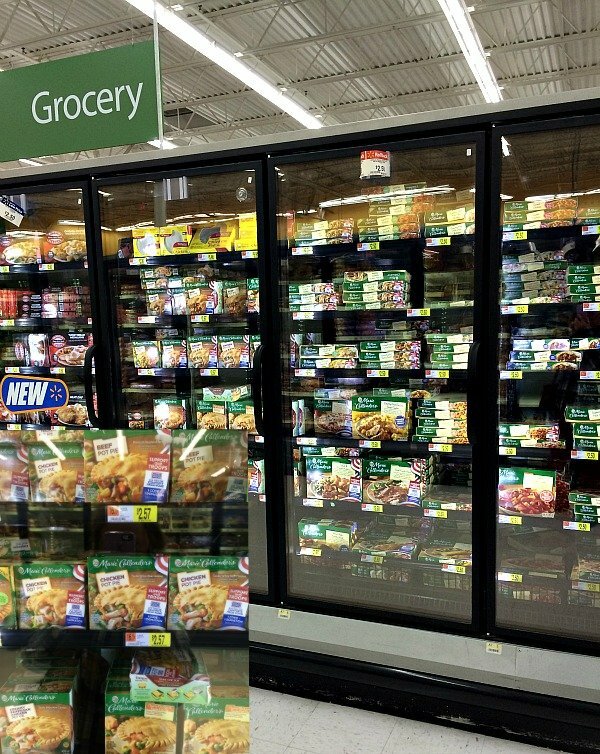 The family size pot pies will take longer to bake.